The Budderoo mountain bike trail is a relaxing 24km return trip down a majestic fire trail. The track is located high on the western ridge of the Budderoo National park. The fire trail is lined with plenty of eucalyptus trees and ferns and is very scenic. The trail is suitable for someone that is learning the ropes of the mountain biking art. However experienced riders will also enjoy this peddle for the scenic value and a good workout. While in the area the Jamberoo lockout is worth a visit and offers fantastic views. I highly recommend this ride. Enjoy the day out. Directions to the Budderoo Mountain bike track. Google Map Link. Head down Jamberoo Mountain Rd and turn onto Budderoo Plateau Rd. The trail is only a short distance from the turn off. 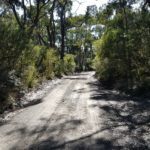 Budderoo mountain bike trail Photo Gallery. Budderoo mountain biking Youtube Clip.